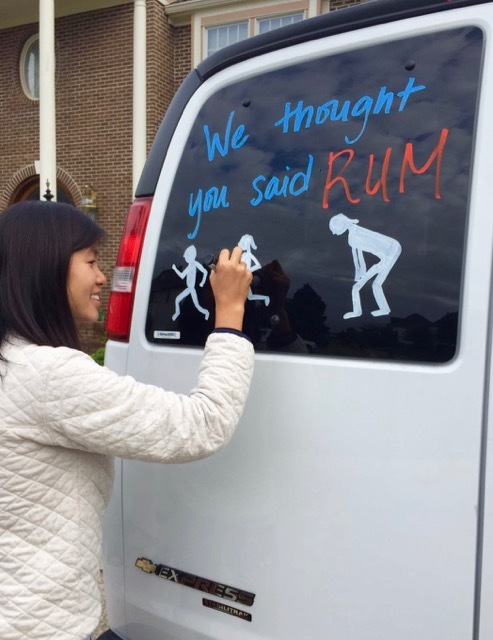 Twelve runners, two vans, 206.7 miles to cover, and an estimated 36 hours to finish – that’s the adventure that our team, We Thought You Said Rum, had ahead of us last week. 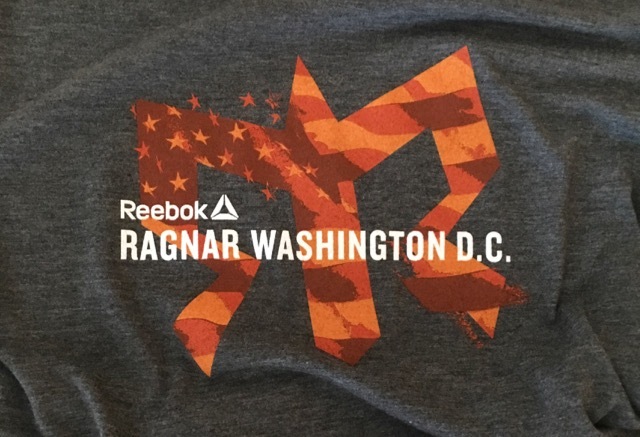 Equally daunting will be my effort to tell the story of our incredible adventure in just four short posts starting with today’s 2016 Ragnar DC Recap Part 1. 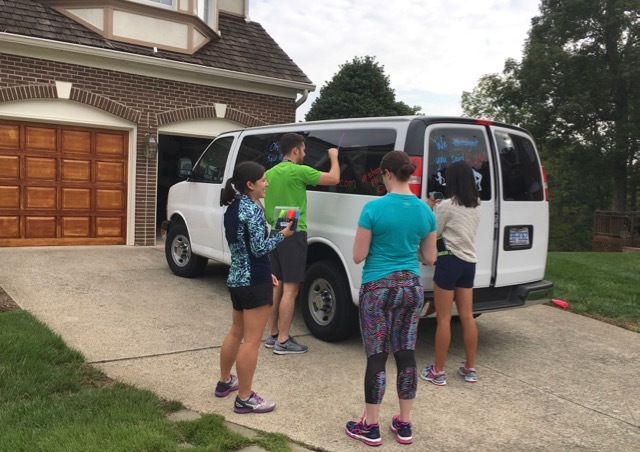 With packing and van decorating behind them, the lovely ladies from Van 1 got the show on the road when they headed toward Cumberland, Maryland at 6:15 PM on Thursday. 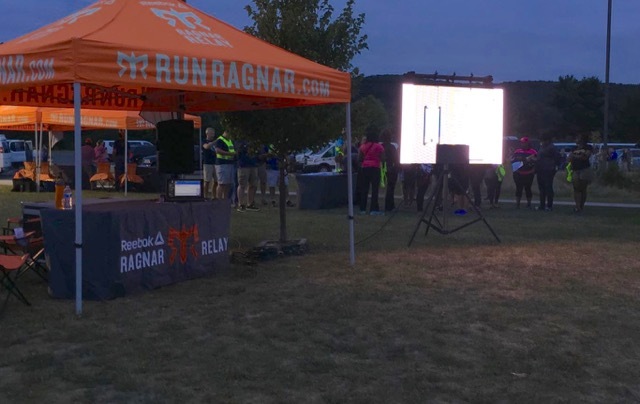 First up was checking our team in at the Ragnar starting village, going through the safety inspection, watching the video, picking up their shirts, etc. 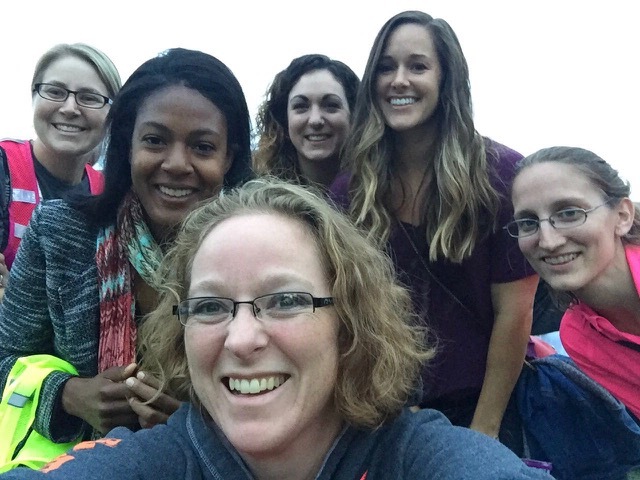 Van 1 team members were (left to right, starting with the front row) Tammie, Laura, Ellie, Stacy, Katie, and Nicole. With these items of housekeeping behind them, they didn’t have to show up at the starting line a full hour before their 6:15 AM start time, and were able to catch just a few more winks in the comfort of real beds before moving into their four wheel hotel/kitchen/changing room for the next 36 hours. Meanwhile, back in Virginia I was putting the finishing touches on my packing. 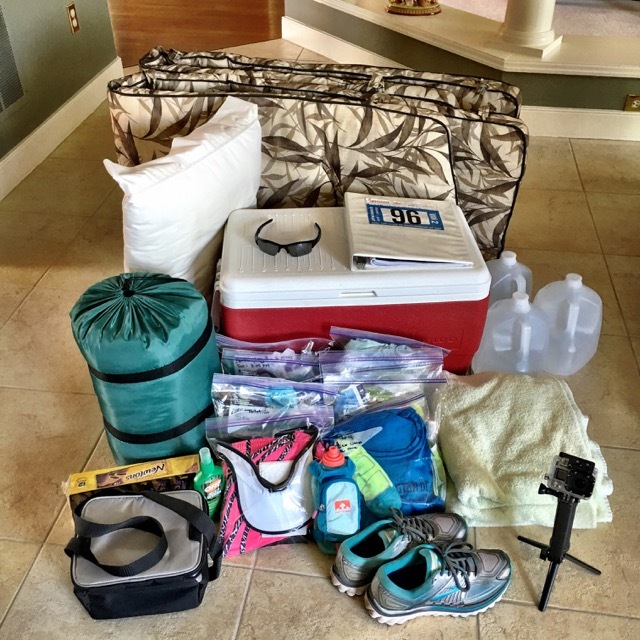 I’d started collecting items earlier in the week, bagging my running outfits, fuel, etc., but didn’t do a final run down through my check list until Thursday afternoon. 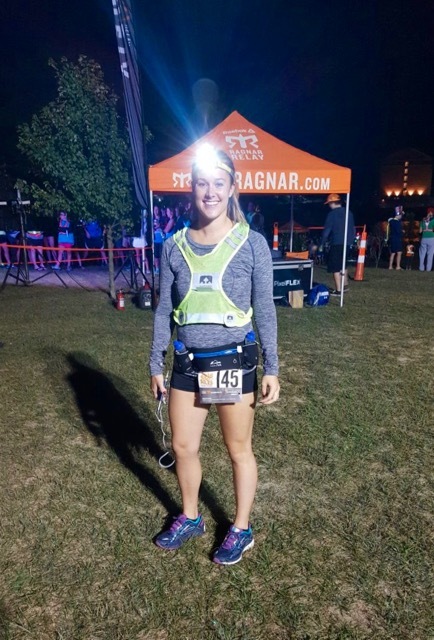 Bright and early Friday morning, Katie started our team off and since she was starting before 7:30 AM, she had to wear her reflective safety vest, headlamp, and strobe taillight. 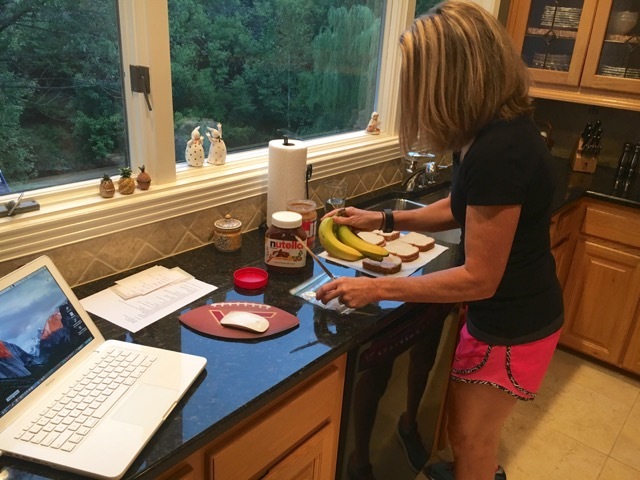 Friday morning I had an assembly line of peanut butter and banana sandwiches going. 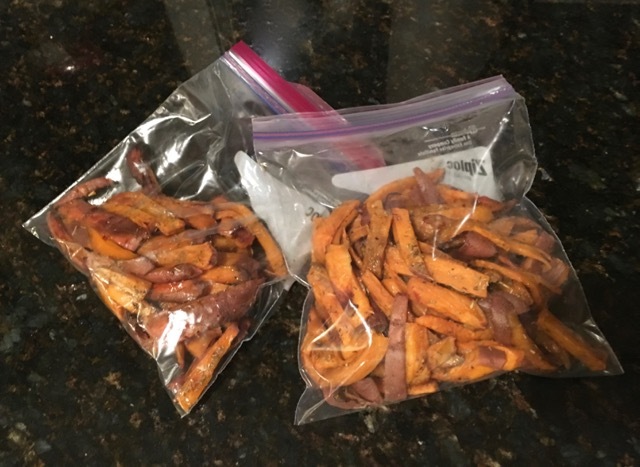 I also packed homemade sweet potato fries that I’d made the night before, Greek yogurt, fresh fruit, fig bars, Gatorade, chocolate milk, and plenty of water. Our friend Chuck, who was on our 2014 Ragnar DC team, was in charge of our van rental and after picking up our other four teammates, stopped by to pick up me… and Bill. Yep, my sweet husband volunteered to be our van driver! First things first, though, we had to decorate our van! Who knew we had such an artist on our team? It wasn’t until we got into Maryland that we saw our first Ragnar decorated van up ahead, and Katie said, “So we did get the right weekend!” Always competitive, Daniel chimed in, “Let’s get the kill.” Sadly, Bill did not risk a speeding ticket to get our first kill (passing another runner) of the weekend. This is just a small example of the fun bantering back and forth and goofing off that we had in Van 2 all weekend, something Daniel dubbed shevanigans. We stopped at the rest stop on Sidling Hill for a quick break to stretch our legs. While there, I made sure to point out to Daniel just how steep the mountain road was and remind him of what he’d gotten himself into. In just a few short hours he would be running the same legs that I’d run in 2014, and that included running up to the top of Sidling Hill and back down the other side. The pressure was on! Van 2 team members were (left to right, starting with the front row) Katie, Deb, Daniel, Chuck, Melinda, and Jess. Once we arrived in Little Orleans at Exchange 6 we took in the scenes of the Ragnar Village in all of it’s glory. 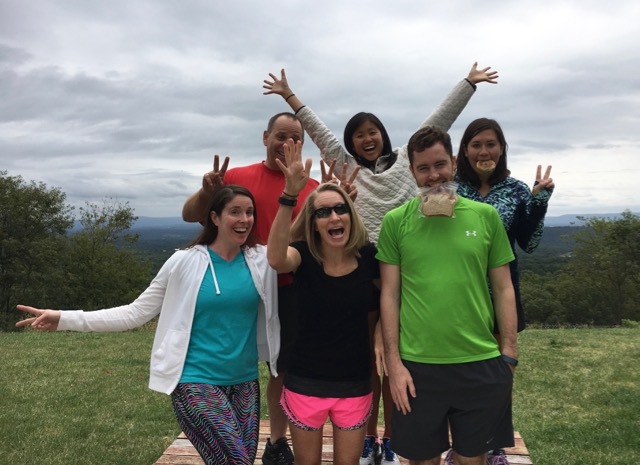 This panorama shows the side of the village where the last runner from Van 1 comes in to hand off the slap bracelet to the first runner of Van 2. The other side of the village holds a variety check in stations for Van 2 members. 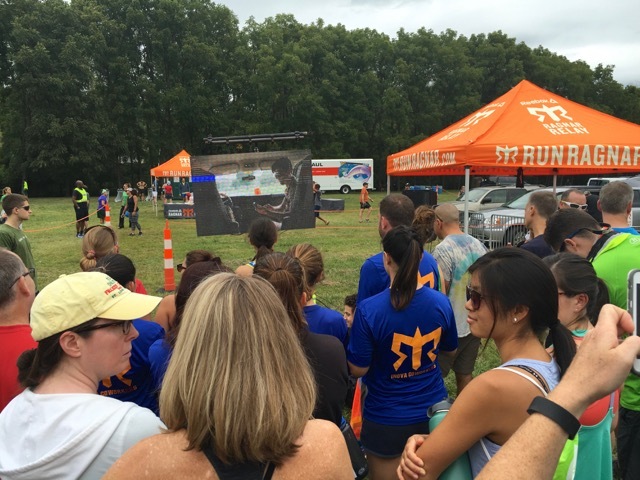 After the Van 2’s initial check in and night-time gear safety inspection, all Van 2 team members were required to watch the safety video before their team could send out Runner 7. Once the video was over, each team captain or Van 2 representative picked up Van 2’s bibs, team number van sticker, van magnet, shirts, and crossing flags. As I mentioned back in May in my post where I vented about Ragnar switching from men’s/women’s sizing to unisex shirts, the unisex shirt doesn’t fit well and is rather blah. In fact, it’s the exact same shade of gray as my Ragnar Trail Richmond shirt. The fabric is super soft and if it were a better fit, I’d give Ragnar lots of free advertising while wearing it around. While picking up our gear, we saw our Van 1 teammates and introductions were made for those who hadn’t met each other yet. Together, we headed over to the dusty exchange area to watch for Laura to come in and hand off to Jess – starting Van 2’s turn at running. We made the decision as a team that we didn’t mind losing a few minutes by having Jess hang out for a team picture after Laura handed her the slap bracelet. It was a great decision because otherwise we wouldn’t have gotten a team picture until after we finished. Inviting my hubby along was also a great decision, because not only did he take the stress out of driving away from those of us in Van 2, but he also took some amazing pictures! Around 12:50 PM, Jess took off running as the rest of us in Van 2 said good-bye to our Van 1 teammates. We then took off in hot pursuit of Jess, and in hopes of getting some good pictures while cheering her on along the way. Stay tuned for pictures, commentary, elevation charts, and much more on Thursday as I recap Van 2’s first set of legs! Editor’s note: Click here for Part 2. 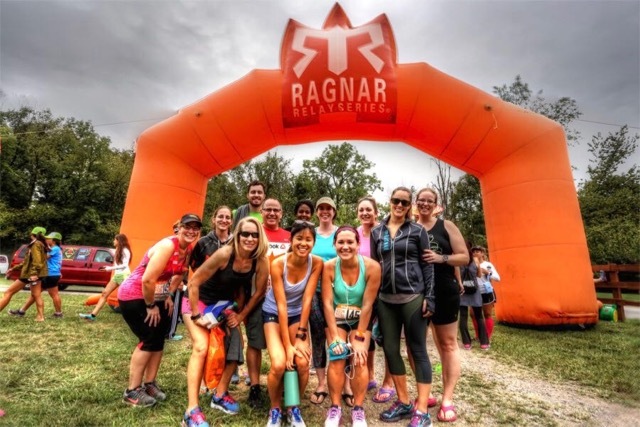 Have you ever run Ragnar DC, another Ragnar, or similar relay? 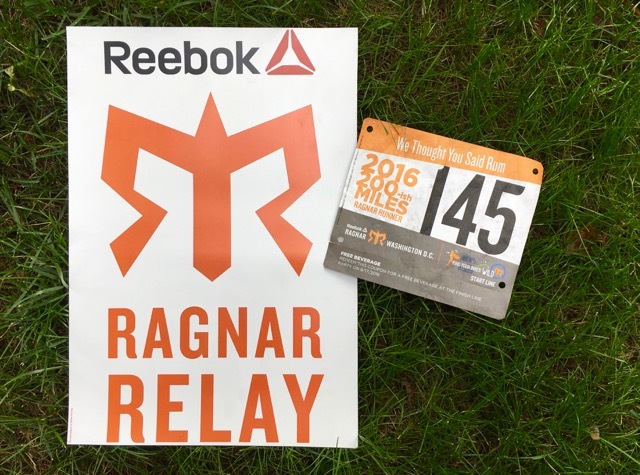 Oh my gosh, so much planning and organizing goes into running a Ragnar, especially for the team captain. It’s worth it in the end, though, because it’s so much fun! It sounds like you need to add sweet potato fries to your menu for tonight! Interesting you are not a fan of the unisex shirt, I was so EXCITED to hear they switched. Not sure if I love that it’s not a tech-tee, as I do love those, but I think the material is so soft, and I love the fit. Unisex sizes seem universal where I swear women’s sizing it just a shot in the dark, ALWAYS. I agree that the material is fabulously soft, but that thing chokes me and the sleeves are too long for short sleeves for my liking. All of the women in our van were disappointed that it was unisex, and when I took an informal survey with my running friends when we got the Richmond Trail shirt, every single one of them said they preferred a female cut. I plan to cut the neckband out so it doesn’t fit so high and cut the sleeves off a little shorter, and then sleep in it. At least I’ll get use out of it! It’s good that you like it! Hmm, all the women on my team liked the unisex shirt. I guess if they keep alternating, everyone can be happy every other year. My team started at 6:15 also, the weather was great on Friday. I love your team picture under the arch at the first major exchange, what a good idea. This was my first Ragnar with absolutely no rain, and it was delightful! This looks like so much fun!! And so much prep! Yep, tons of fun and tons of work getting ready! 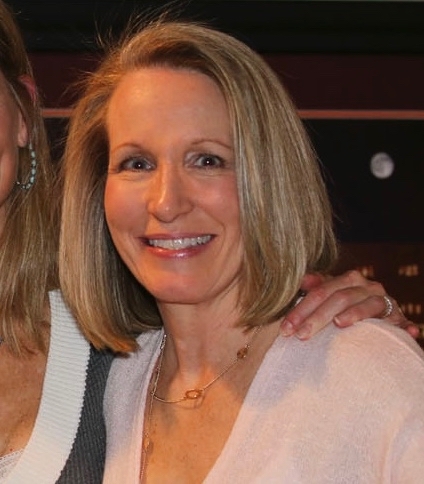 We have always allowed each person to pick which runner number they want to be in the order they join the team – basically first come, first serve. Last year when I joined another team, they encouraged me to pick the leg with the most mileage since I was the most experienced longer distance runner, and I was totally fine with that. 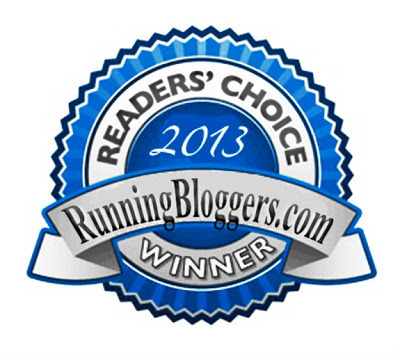 Of course, the leg distances can change as Ragnar finalizes road permits, etc. 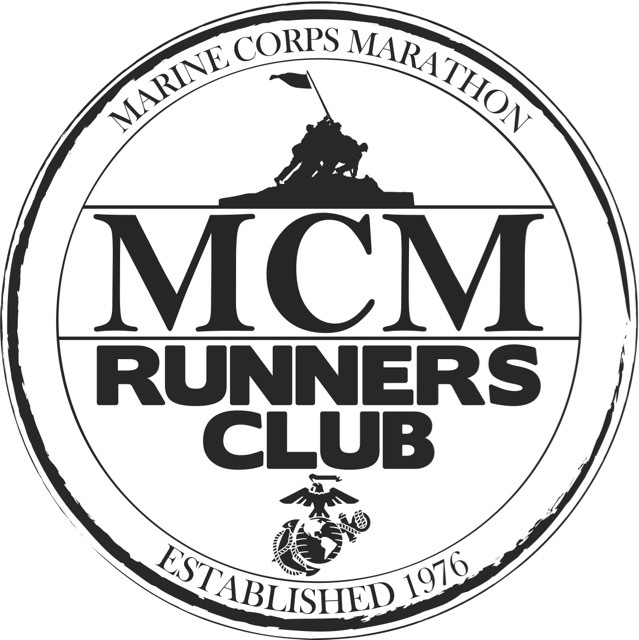 I was originally scheduled to run about 26-28 miles this time, but by race day, my mileage was down to 21 miles due to slight changes in the course or moving the exchanges slightly. The logistics of this sound insane! If I ever get the opportunity to do one, I’d definitely want a veteran(s) on my team. I’m impressed you packed sweet potato fries. I bet they tasted fabulous. The van art is very well done too. Fun, fun, fun. 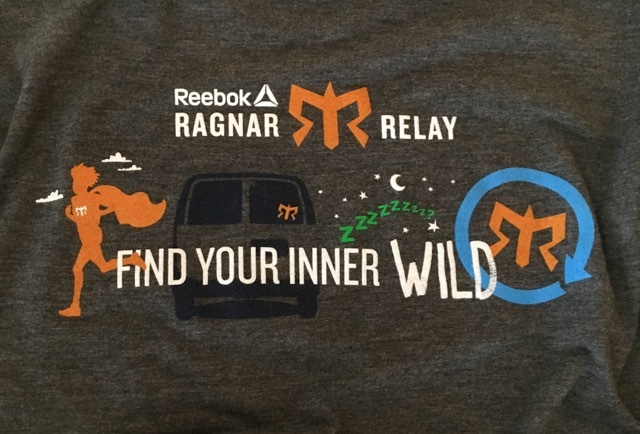 For my very first Ragnar, I was the team captain, but fortunately I had a Ragnar veteran in my van and a couple in the other van. It made it much easier since someone in each van knew what to expect. Sweet potato fries are my Ragnar staple. They are easy on my stomach and since I will be eating and then running at crazy times, I need to know I have food packed that won’t mess with my stomach.